There is another law, the Ideal Gas Law which says that the temperature of a planet is dependent on atmospheric pressure at the surface at a given level of solar input and that atmospheric pressure is dependent on the mass of the entire atmosphere with no special influence afforded to GHGs. In other words, the composition of the atmosphere is irrelevant and AGW theory would be falsified. This article will try to ascertain why that discrepancy has arisen and to decide which scenario is correct. “This is significantly colder than the true average temperature of the Earth’s surface, which is 13 celsius (286 K). The difference is caused by the famous greenhouse effect. This is a warming effect caused by the existence of certain gases in the atmosphere (notably carbon dioxide, but also including methane and various artificial industrial gases). Such greenhouse gases are transparent to the visible portion of the electromagnetic spectrum, which corresponds to most of the incoming solar radiation, but strongly absorb infrared radiation, which is where most of the Earth’s thermal radiation is emitted. The overall effect is to raise the Earth’s equilibrium temperature to a somewhat higher value, where the increased thermal radiation compensates for the re-absorption of energy by the greenhouse gases. “Increasing albedo or atmospheric absorption, or decreasing greenhouse warming, will tend to make the surface cooler”. i) Note that the maths deducts ‘absorption’ by Earth’s atmosphere to arrive at -23 celsius. ii) The resulting figure is lower than that observed so it is corrected by assuming downward radiation from GHGs with a consequent warming effect to bring the figure up to that observed of 13celsius to give a temperature 36 celsius higher. A little higher than the usual quoted figure of 33 celsius but near enough. If an atmosphere does NOT make a planetary surface cooler then AGW theory is falsified because there is then no need to add in a warming effect from GHGs. Does An Atmosphere Warm Or Cool a Planetary Surface ? It is clear that a planet without an atmosphere shows extremes of heat and cold with the coming and going of solar input to the surface as the planet rotates. When there is no atmosphere the solar energy goes straight in and straight out via radiation alone giving extreme highs and extreme lows of temperature but little energy storage in or on the planet. 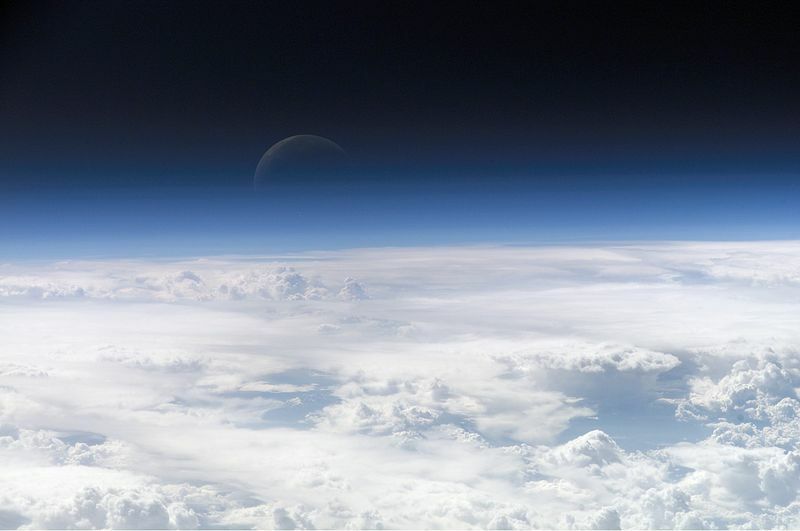 The average temperature will be between the two extremes and the question is whether adding an atmosphere makes the average temperature higher or lower than it would be without an atmosphere. i) It diffuses energy across the surface and around the planet and ALL mass in the atmosphere participates, not just GHGs. That must be so because all the non GHGs are at the same ambient temperature as the GHGs at every level in the atmosphere. The non GHGs acquire their energy via conduction from the solar heated surface assisted by convection causing an air circulation plus conduction from each other and from GHGs in the atmosphere. ii) It introduces a time delay between energy arriving at the surface and that energy subsequently leaving to space from the top of the atmosphere. In view of that time delay the planet will be warmer than the average of the extremes for a planet without an atmosphere. An atmosphere WARMS a planetary surface so why does AGW theory put a number in for COOLING as a result of absorption of energy by an atmosphere? AGW theory assumes that energy absorbed by an atmosphere is continually denied to the surface but in fact that is only a temporary phenomenon lasting only for the exact length of time during which there is a delay in transmission of energy through the system mentioned in ii) above. Once that (very short) time delay has passed, the system is back in equilibrium with that HIGHER surface temperature that we do indeed observe. A HIGHER surface temperature is therefore an inevitable consequence of ANY atmosphere, whatever the composition. So, for a system at equilibrium the atmosphere does NOT cool the surface and that negative figure for absorption by Earth’s atmosphere should NOT be in the AGW calculation so that the inferred downward energy flow from GHGs is no longer required to balance the numbers. The AGW theory appears to be based on a misguided application of the S-B Law. They assume a cooling effect from atmospheric absorption of energy which then has to be countered by a warming effect from downward radiating GHGs to make the energy budget balance. A planet with an atmosphere will always be warmer than a planet without one and there is no limit to that additional warmth if the density of the atmosphere, regardless of composition, increases. Gravity ensures that the more mass there is in the atmosphere the more molecules will be present in each unit of volume at the surface and the higher the temperature response to incoming solar irradiation will be. The solar energy doesn’t even need to reach the surface. If the incoming solar energy is completely absorbed at a point within the atmosphere but above the planetary surface the heat will still be conducted down to be shared amongst the molecules of the even denser atmosphere at the surface below. There is no limit to the surface temperature that can be achieved from increasing atmospheric density towards the surface as long as the atmosphere remains gaseous and gravity maintains the surface pressure whilst solar irradiation continues at any given level. Removing that non-existent cooling effect from the AGW equation and replacing it with the actual warming effect will bring the numbers into balance with no need to propose any downward energy from GHGs in the air. AGW theory relies on a gross misunderstanding of the effect of an atmosphere and of the non radiative processes as defined and quantified by the Ideal Gas Law. The Ideal Gas Law Calculation. Note that there is no term for the presence or absence of GHGs or their radiative characteristics. Yet the Ideal Gas Law works without such a term. If the temperature of a planet’s surface were affected by the radiative characteristics of GHGs then the Ideal Gas Law would not work, it would have been falsified long ago. The failure to appreciate that it is the Ideal Gas Law that governs the surface temperature of a planet with an atmosphere has led to the misapplication of the S-B Law that I describe above. On the basis of the above I submit that the entire AGW theory is wrong and that the only effect of more GHGs in the air would be a more energised air circulation but the change would be so small as compared to natural sun and ocean induced changes that we could never measure it.